If you’re wondering what kettlebell exercise would be perfect to start your workout routine with, the kettlebell row makes a great candidate. Since most of your body is in a fixed position during this exercise, you can expect little muscle fatigue and stress. Most of the load will focus on your arm and back. To begin, stand with one foot forward with the kettlebell resting beside it on the floor. Your other foot should be planted behind you. 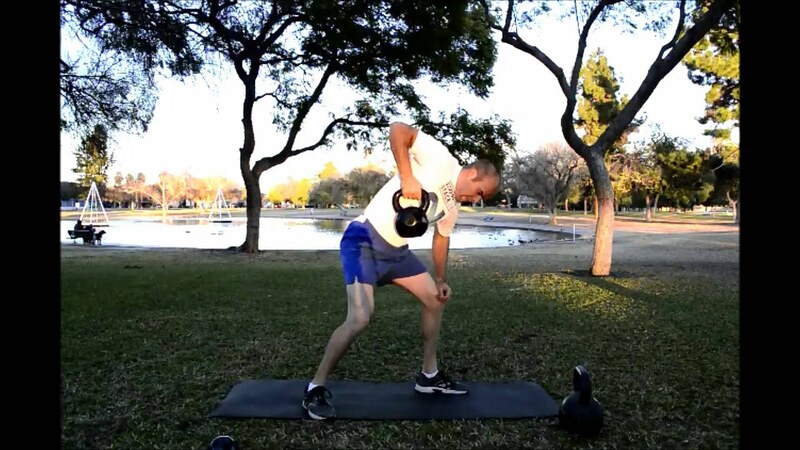 Pick up up the kettlebell with the hand opposite of your forward foot. You’ll then use your free forearm to rest on your bent leg. Once set, lift the bell past your waist with your elbow as high as possible. Return the bell to the floor position to complete the rep. It is recommended that you perform this exercise in a set of 10 reps. When you finish the first set, switch positions so that you’re legs are swapped from the back and front. Of course, you’ll switch the arm and hand you use to perform the next set too. While not overly exerting, the kettlebell row is an excellent way to warm up or cool down at the beginning or end of your exercise routine.